First came the race to 99 cents, then the rise of freemium and in-app purchase models. In 2016, Apple rolled out expanded support for the subscription model in iOS apps — suggesting that subscriptions were the future for publishers on the App Store. So what’s the state of play in 2018? 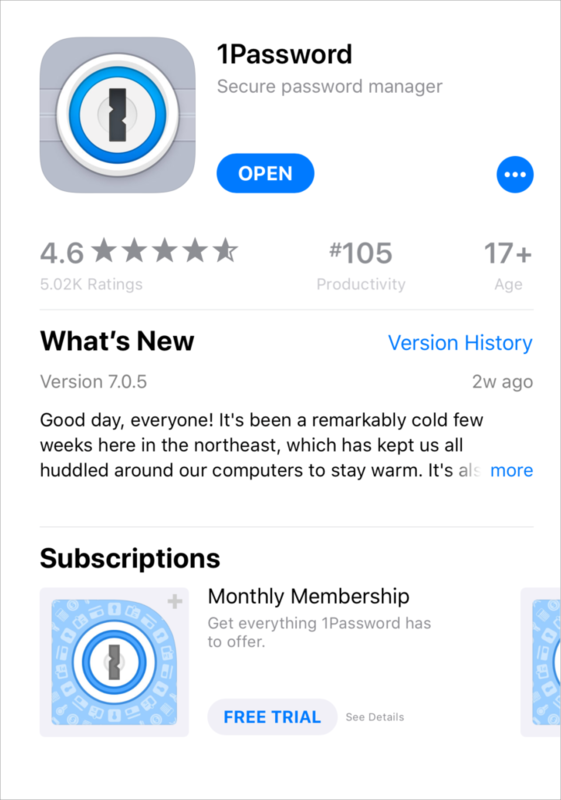 Back in June 2016 we published Welcome to the subscription economy, Apple — at the time Apple had revealed its plans to completely revamp its iOS App Store, and as a part of the update, include expanded support for subscriptions as a billing model for iOS apps. Over 18 months have passed since this announcement, and native support for subscriptions on iOS is fully rolled out and available to app publishers. So what does the landscape look like today? Read the full specification here. At the time of writing, Spotify does not make use of native subscriptions in its iOS app. In fact, with the exception of preexisting accounts subscribed through iTunes (which are grandfathered), users can no longer subscribe and manage subscriptions in-app — this all has to be done through Spotify’s website. In other words, Spotify has completely checked out of Apple’s ecosystem for managing paid subscriptions. After a recent public complaint letter to Jean-Claude Juncker, president of the European Commission, it’s clear that the company has had enough — even with recent changes to the fee structure. This strategy of abstinence is similar to audiobook platform Audible, which after some back and forth with Apple chose not to subscribe to the platform’s fee structure. Audible does not allow users to purchase new books in its iOS app — it will only play previously purchased books. The user can browse the store and add books to their wishlist, but the purchase must be completed on the web (and there is no web link to do that). This results in a worse (and to some extent confusing) experience for the end user, who typically ends up as the loser in such scenarios. So who is embracing subscriptions? Subscriptions are given a dedicated section of the App Store listing on iOS. A single app can display multiple subscriptions here; e.g., monthly, annual, etc. With App Store subscriptions, Apple has done what they’re renowned for being great at: enforcing a standardized user experience that people can understand and is in no way hostile. 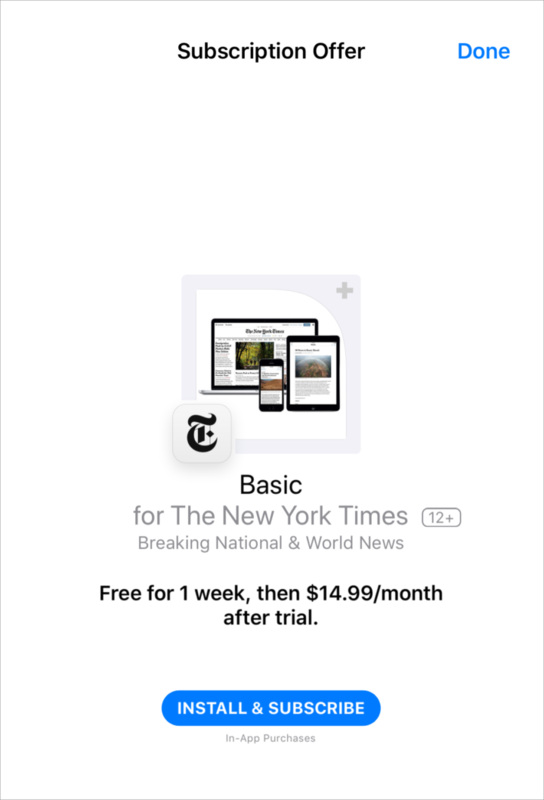 With these changes, subscribing to the New York Times is exactly the same flow as subscribing to 1Password (or any other app). Secondly, the built-in free trial functionality gives users the confidence to try out the service before subscribing. Smartphones are to many people the primary way they interact with the world. Apple is providing a way for people to discover, subscribe and manage their subscriptions that is native and optimized for the smartphone. Purchasing with a single tap of your finger beats manually typing payment information on a computer or getting rerouted to external payment platforms. The App Store as a platform is familiar with every single user of an iOS device. People trust that they can spend money and store their credit card details without the security concerns that come with paying a smaller vendor. 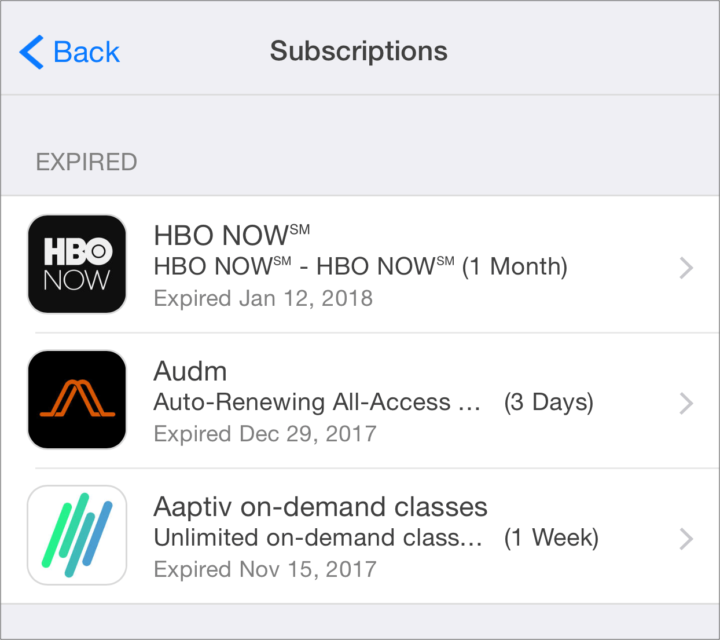 It might seem like these new subscription features may be putting more control in the hands of the user at the expense of the publisher — it’s easier for a user to keep track of and cancel their subscription through Apple’s standardized features. However, this is largely a redundant argument. In reality, a smoother experience for users will lead to increased customer happiness. If a customer really wants to cancel their subscription, putting barriers in their way only serves to increase frustration. This generates negative brand association that only hurts your chances of future reactivation — why would users ever come back if they’ve had a horrible experience unsubscribing in the past? Secondly, it’s worth noting that friction for users has been reduced at both ends of the customer lifecycle. It’s just as easy for users to start a subscription as it is for them to leave, and work has clearly been done to make sure that both trial onboarding and trial-to-paid conversion is seamless. The fact that free trials automatically convert to paid subscriptions is a big deal in itself. The new fee structure for subscriptions on the App Store is not about yielding to pressure around high fees for developers. Apple knows that the success with the subscription model relies on delivering ongoing, long-term value for users. This is why there’s an incentive to keep customers active beyond one year, in the form of reduced fees. then now’s a great time to implement the native subscription features of the platform and take advantage of a vastly improved experience for your users. Welcome to the Subscription Economy, Apple.